"Swiss Army Man" begins with Paul Dano, alone on a deserted island... a survivor of some sort of wreck or accident. Life is no longer worth living for him; so Dano sets up a noose and prepares to hang himself. But then he sees the corpse of Daniel Radcliffe, washed up on shore. Now Dano has hope... hope that turns to delight, as he discovers the corpse has the ability to pass gas with such force he can use him as a human jet ski, and even use his ability to hurl projectiles long distances. Soon the corpse begins to speak and together, the two discuss the joys and despair of life. 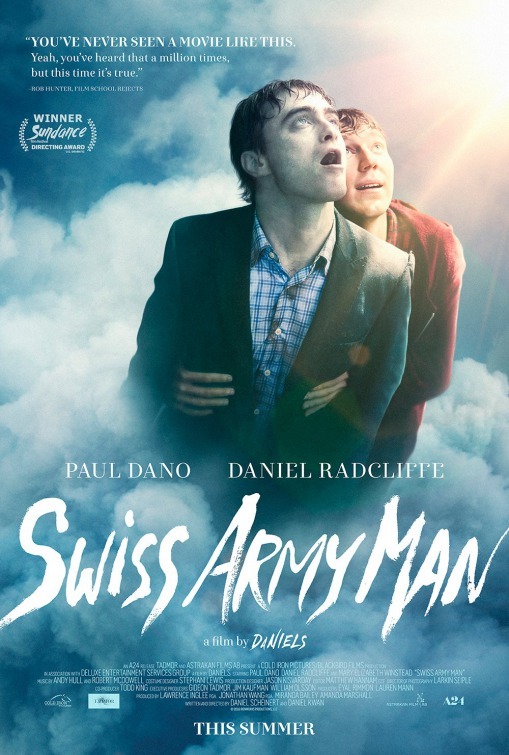 "Swiss Army Man" can be seen as creative, touching and different. Or it can be viewed as a silly waste of time about a farting corpse and a loony boy. As much as I appreciate movies that try for something different, I pass on this one. Does it deliver what it promises? Madness. Is it entertaining? Slow, depressing and confounding. Is it worth the price of admission? Skip it.